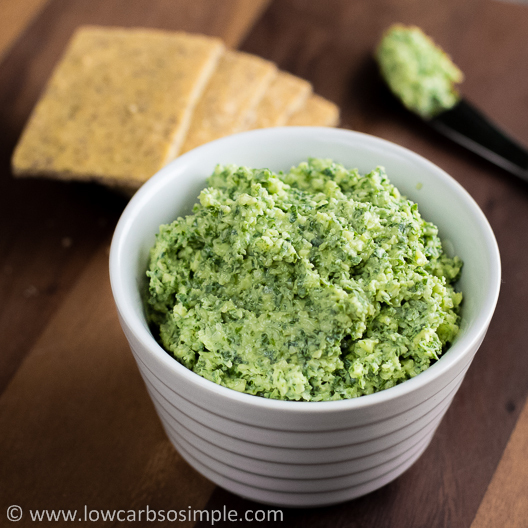 Cheesy Kale Spread | Low-Carb, So Simple! -- gluten-free, sugar-free recipes with 5 ingredients or less | Low-Carb, So Simple! 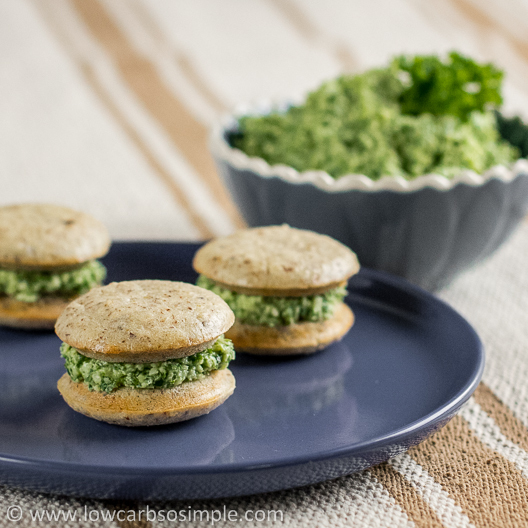 Here is an easy and delicious spread for all kale lovers. This is a great alternative to kale smoothies and salads. Spread this rich and tasty specialty on gluten-free bread and crackers. Whip up a batch for a cozy weekday evening or serve the spread in a decorative bowl for a party. Rinse the kale leaves and pat dry with towel or paper. Tear the leaves into smaller pieces. Discard the thick stems in the middle. 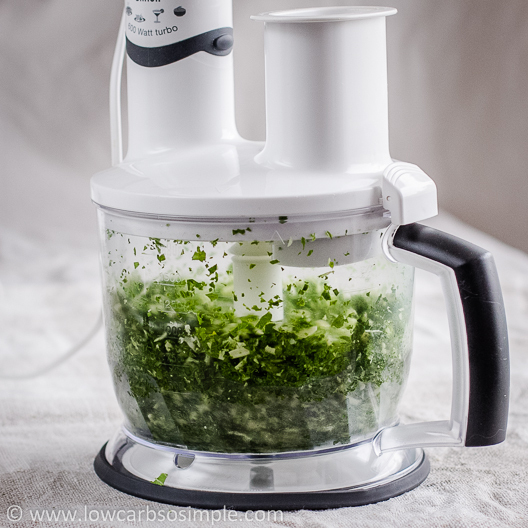 Place the kale leave pieces together with the garlic cloves in a food processor bowl with the cutting blade attachment. Process until very finely chopped. You can also use blender. Add the shredded cheese and process again until relatively smooth. Remove the blade or if you cannot do that, transfer the mixture to another bowl. Add the cream cheese and mix with spoon until well mixed. Add more cream cheese if you prefer softer consistency. Mix well after each addition. Spoon the spread into a nice little serving bowl and serve. Making of this spread doesn’t require any tricks, so let’s get started. Clean and dry the kale leaves. Tear the leaves into smaller pieces. Discard the thick stems in the middle. 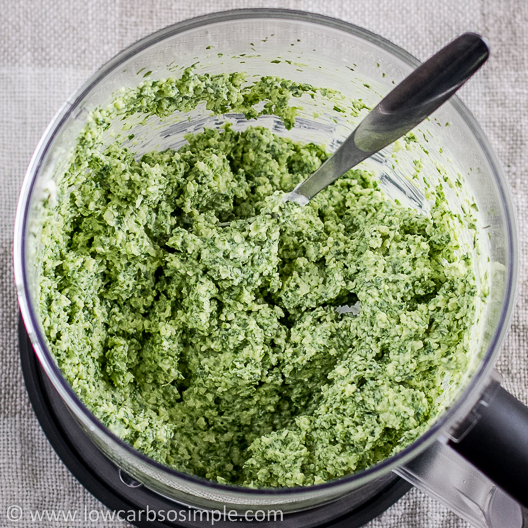 Place the kale leaves and the garlic cloves in a food processor bowl where you have attached a cutting blade. If you don’t have food processor, blender is also fine. Add the shredded Swiss cheese. Process again until relatively smooth. Remove the blade or if you cannot do that, transfer the mixture to another bowl. Add the cream cheese. Mix with spoon until well mixed. Add more cream cheese if you prefer softer consistency. Mix well after each addition. Spoon the spread into a nice serving bowl and serve. First I was thinking of kale pesto, but that sounded too worn out. Then I thought of savory spread. Something rich and flavorful. I have a German cookbook with recipes only for savory and sweet spreads. There I found a nice recipe with arugula, Swiss cheese, butter and white wine vinegar. Instead of arugula, I wanted to try out kale. I thought I leave out the vinegar and add garlic instead. I was pondering what amounts to use. In the German recipe there was only 1.75 oz (50 g) arugula. The amount felt small, but that was understandable: the flavor of arugula is quite strong, mustardy and even slightly hot. As for kale, the flavor is somewhat strong but far away being hot. I decided to use 4 oz (115 g) kale leaves, 6 oz (170 g) Swiss cheese, 8 tablespoons (4 oz = 115 g) softened organic butter, 5 small garlic cloves and 1 tablespoon unsweetened mustard. Mustard I chose to give some kick. Well, and I simply thought it goes well with the flavor of Swiss cheese. First I added the kale leaves to a food processor and processed them until they were tiniest pieces. The smell of kale was really strong. It was really exuding health! I added the shredded Swiss cheese and processed the mixture again. Finally I added the butter and the crushed garlic cloves and mixed the whole thing with a spoon. Eagerly, I tasted the result. To my big surprise butter was feeling too greasy and the kale flavor was really strong, I would say overpowering. I was wondering if full-fat cream cheese would be a better choice. In my next experiment I simply replaced the butter with 6 oz (170 g) cream cheese and omitted the mustard. Much better! Perfect, actually. The spread was quite firm but I liked it. I got the idea to process the garlic with the kale leaves. Then I didn’t have to crush the garlic before adding it to the mixture. The idea worked extremely well and naturally saved some time. And meant less dishes. If you don’t like garlic, you can leave it out or replace it with something else. Good old white pepper or black pepper are worth trying, also onion powder might suit well. A teaspoon or two freshly squeezed lemon juice is also a great addition. Raw apple cider vinegar gives some fresh tang, too. You can also add more salt if needed, but for me the saltiness of the Swiss cheese is enough. 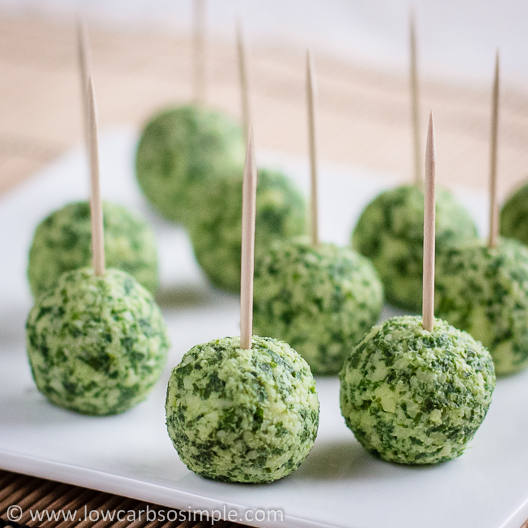 You can form balls or other shapes from the spread and serve them in parties. Forming is easier if you let the spread set in the fridge for a few hours. 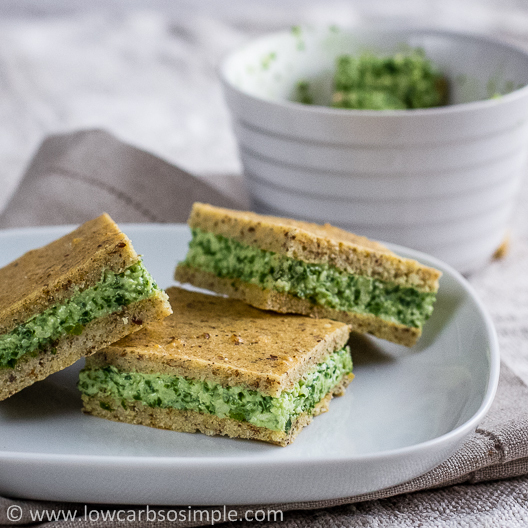 This spread is also great filling for savory whoopie pies. The rest of the week I’m going to spend developing creepy Halloween recipes for my Halloween party. I hope I have a really gruesome recipe to publish next week. Meanwhile, you can take a puke… sorry, look, of my Halloween spread from last year. Thank you, Kelly! Did you have any chance to try it out? Sorry my reply comes late, the security plugin has blocked me out from my own blog and I can access the blog only occasionally. I just love all of your recipes!. Is there anyway to get total carbs for your recipes?. Hi Dee, thanks for your question. So far I haven’t been thinking of that and even the software I’m using for calculating the nutrition info doesn’t support total carbs. However, if there is a continuous need, I have to find out how to do it. Thanks! Hope you like the spread of you happen to try it out! Btw, you seem to have a great blog, I definitely have to take a closer look of that!